When you save an Office document, pictures and SmartArt graphics are automatically saved with your file. 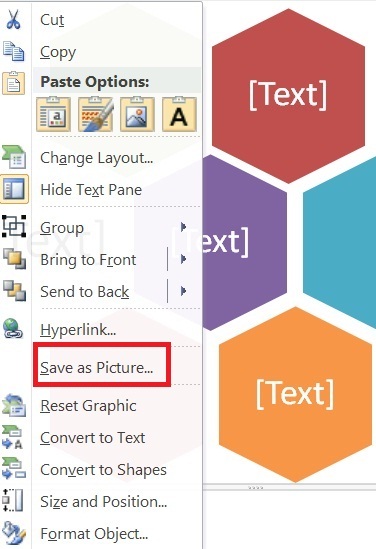 You can also save a picture, SmartArt graphic, or PowerPoint slide that contains a picture or SmartArt graphic to a separate file—such as a .jpg, .gif, .bmp, or .png file—that you can embed or insert into any program that supports that file type. For example, you might want to save a SmartArt graphic as a graphics file if you want to lock it so that it can't be edited. Right-click the picture, and then click Save as Picture. In the Save as type list, pick the graphics file format you want. You can save a SmartArt graphic in a graphics file format such as Graphics Interchange Format (.gif), JPEG File Interchange Format (.jpg), or Portable Network Graphics Format (.png). In an email message, click the SmartArt graphic that you want to save in a graphics file format. On the Message tab, in the Clipboard group, click Copy. 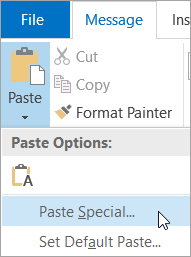 On the Message tab, in the Clipboard group, click the arrow under Paste, and then click Paste Special. In the Paste Special dialog box, in the As list, select the graphics file format that you want. Right-click the newly pasted image and click Save as Picture. In the File name box, type a name for the document, and then click Save. Right-click the picture that you want to save in a graphics file format, and then click Save as Picture. In the Save as type list, select the graphics file format that you want. In the File name box, type a new name for the document, or do nothing to accept the suggested file name. Click the SmartArt graphic that you want to save in a graphics file format. On the Home tab, in the Clipboard group, click Copy. On the Home tab, in the Clipboard group, click the arrow under Paste, and then click Paste Special. Click File > Save As, and then choose a location for the file. In the Save as type list, pick a graphics file type. Name the slide, click Save, and in the message that appears, click Just This One. Graphics created in one program are displayed in another program exactly the way they appeared in the original program. Supports 256 colors and no image data is lost when the file is compressed. Best used for pictures with many colors, such as scanned photos. Improves the quality of graphics on a web site because parts of the image can be transparent and brightness can be controlled. You can save a picture in a graphics file format such as Graphics Interchange Format (.gif), JPEG File Interchange Format (.jpg), or Portable Network Graphics Format (.png). Note: To work with your file in another program, insert it as an object. In the email message, click the SmartArt graphic that you want to save in a graphics file format. In the Paste Special dialog box, in the As list, select the file format that you want. Type a name for your graphic file, browse to the location where you want to save the file, and then click Save. Click Save As, and then in the Save as type list, select the graphics file format that you want. In the message that appears, click Current Slide Only. You can save your SmartArt graphic in a graphics file format such as Graphics Interchange Format (.gif), JPEG File Interchange Format (.jpg), or Portable Network Graphics Format (.png). 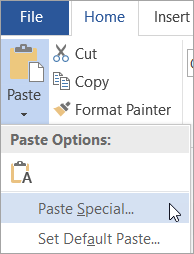 In the Paste Special dialog box, in the As list, click Picture (GIF), Picture (PNG), or Picture (JPEG). To work with your file in another program, insert it as an object. 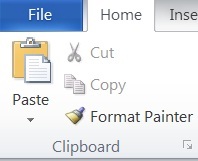 In Microsoft Office PowerPoint 2007 only, to quickly save your SmartArt graphic as a picture, right-click the border of the SmartArt graphic, and then click Save as Picture on the shortcut menu. Important: You can only save your SmartArt graphic in a graphics file format such as Graphics Interchange Format (.gif), JPEG File Interchange Format (.jpg), or Portable Network Graphics Format (.png). Click the Microsoft Office Button , point to the arrow next to Save As, and then click PowerPoint 97-2003 Presentation.